Death makes for a wise narrator. “The Book Thief,” a film based on the novel of the same name by Markus Zusak, has a personified version of Death offer his thoughts throughout the film. He makes the film much more dramatic through his dark comments that often foretell events and help the viewer to get a better grasp of the film’s themes. Despite this, the movie isn’t overly gloomy – it’s heartwarming and charming. 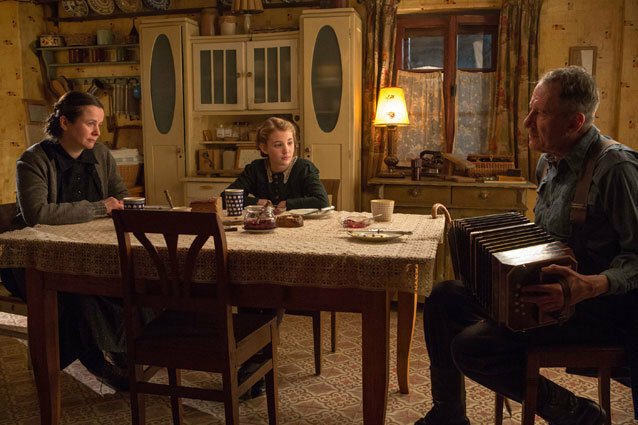 Set in wartime Nazi Germany, it describes the life of a young German girl adapting to life with her foster parents. She struggles with reading but this leads to a ravenous desire to read and collect books later on. Books and the power of storytelling are a major theme in the film. They signify the power of art as a source of hope in times of hardship. Another theme explored in the film is staying true to your morals at all costs. This is thoroughly explored via the heroine’s experiences of harboring a refugee during the Holocaust. Her relationship with him and the risk that comes to her family causes her to question the validity of the propaganda she learns about in school. In general, the film’s setting and costumes are beautifully detailed. The textured backdrop adds greatly to the value of the film in that I admired the surroundings when I was frustrated with plot development. The ending left me feeling empty and frustrated since the characters weren’t well developed enough for me to care about most of them. As a whole, the film was too melodramatic for my taste but worth the time if only to admire the rich detail in the costumes and setting. Good review Sarah. Could have gone a bit deeper into what it was trying to say, but as for a family movie, it does an alright job at not offending anyone whatsoever, yet still telling a story about Nazis.